Puma continues the LOVE FOOTBALL campaign with “Journey of Football”, a television commercial building anticipation in the lead up to the FIFA World Cup being held in South Africa in June 2010. 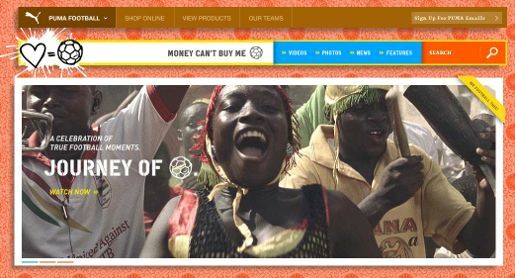 The commercial uses footage from Angola, Ghana and The Ivory Coast, featuring PUMA players Samuel Eto’o, Gervinho, Emmanuel Eboue and Mohammed Zidan. Music is “Going On” by Gnarls Barkley. The campaign, online at www.pumafootball.com and Facebook, includes a range of interactive, print and video work. The Journey campaign was developed at Syrup, an LBi Group Company, New York, by chief creative officer/director Jakob Daschek, creative director Gui Borchert, director of photography Max Goldman, senior producer Kate Cunningham, executive producer Omino Gardezi, editor Graeme Pereira, senior account director Jennifer Giroux, photographer Sesse Lind, associate producer Anders Paus Hedberg. Additional photography is by Boaz Fround and Kate Cunningham. Colorist was Tom Poole at Company 3.